A scissors-type retractable bridge (1) capable of being extended/retracted in an extension direction, wherein a plurality of frame elements (3), including two frame members (2) joined by a pin at a center portion, are joined at distal end parts of the frame members (2) to form a scissors frame (4). During extension of the scissors frame (4), the near-side frame members (2) of the frame elements (3) are linked to each other in a straight line and the far-side frame members (2) are linked to each other in a straight line, whereby an upper surface of the frame members (2) forms a continuous flat surface. 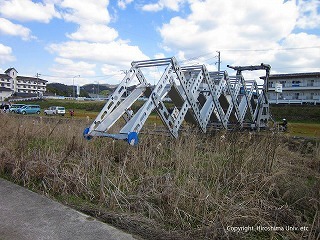 I made sure that the surface will become flat in the state which made a scissors frame be prolonged, so when being capable of carriage, store and development and developing by the easy structure, it's possible to get the scissors bridge system elastic structure which becomes the stable structure. After it's the elastic possible scissors system elastic structure to the extension direction. A frame element including 2 frame parts you did pin combination of each other at a midsection possesses the scissors frame you did pin combination of each other at the point part of more than one kogai frame part. The above frame part in the near side in the above frame element is connected each other respectively like a straight line in the extension time of the above scissors frame as well as the flat face where a surface of the above frame part continued is formed by that the above frame part on the inside side is connected each other respectively like a straight line. The scissors system elastic structure which makes the fact the feature. In the scissors system elastic structure which is mentioning in charge item 1. The above scissors frame faces the inside side, and, more than one, it'll be a bridge girder at the time of extension of the above scissors frame by being lined. In charge item 1 or the scissors system elastic structure which is mentioning in 2. A frame part is equipped with the scissors body with the center pin soutooriana installed in a midsection and the floor part which is installed in the upper side of the gai scissors body and forms the above flat face. In the scissors system elastic structure which is mentioning in one of 1 of charge item 1 or 3. The parts a mutual frame part connects by plane view are the near side and the inside side and shifts to the scissors frame which is at the time of the above extension. In the scissors system elastic structure which is mentioning in one of 1 of charge item 1 or 4. The bottom tip side of the above scissors frame is to expand the distance during a pontoon being supported and when extending, which neighbors more than one pontoon, and it's extended. "we can build this bridge based on experiments of a prototype"